This fantastic park is located on the corner of 17 and 19 in Palatka. It is part of the Putnam County Sports Complex. Project Play was made possible by the community coming together with the help of the Palatka Rotary, to build this great family fun gathering place. 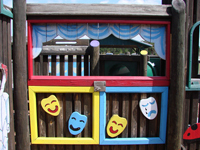 It has kid friendly art, with a space theme, and a farm theme, separate areas for toddlers and big kids, swings, fast slides and a really nice puppet theater for those impromptu talent shows! There is a restroom within the park so kids can use the facilities without going outside the safety fence. One thing I really like about the park is that it has only one entrance/exit, so it's easy to see who is coming and going, so you can relax and have no fear of your little ones running off. There is a covered pavilion area with picnic areas, drinking fountains, and ramps for wheelchairs. This park is similar in construction to Magic Forest in Ormond Beach, and also S.W.I.N.G. park in St. Augustine, in cooperation with the same building company.